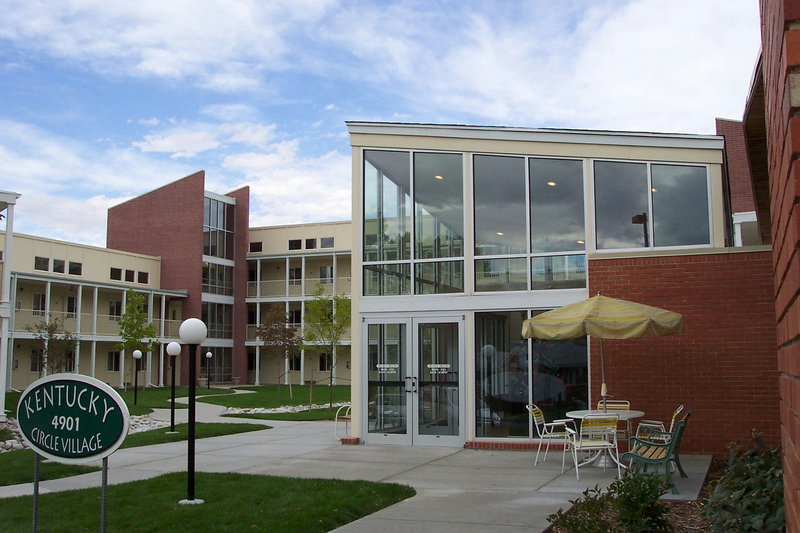 47 low-income independent senior apartments and a remodel and addition to commons facilities were required on an existing campus of 130 units. Initial HUD Financing required FHA design standards. The 40-year old campus of one-story brick apartment buildings created a charming community scale of front porches, tree-lined drives and wonderful courtyard spaces. The campus, however, had no cleared site for a new building. Strategic master planning resulted in the most economic design that demolished one building and moved another to create a building site that established a shared community courtyard adjacent to the commons building. A single-loaded scheme allows all the new units to continue the front-porch pattern of the campus, and maintains the scale of the buildings. Two story buildings step up to three at the site’s East edge, moderating the building’s scale to fit the site. A new commons entry piece creates a needed focal point and clear campus entry.